MUNICH, 2015-6-11 — /Travel PR News/ — Ethiopian Airlines, the fastest growing and most profitable aviation group in Africa, is pleased to announce that it has – for the fifth year in a row – won the 2015 Airline Reliability Performance Award from Bombardier Aerospace on May 26 at the Sheraton Arabellapark Hotel in Munich, Germany.This accolade comes just a few days after Ethiopian Airline Group CEO was awarded the 2015 International Grand Prix special ‪award in Milan. The Airline Reliability Performance Award is a highly respected award in the industry and is also regarded as a mark of distinction for the recipients, their employees and their customers alike. 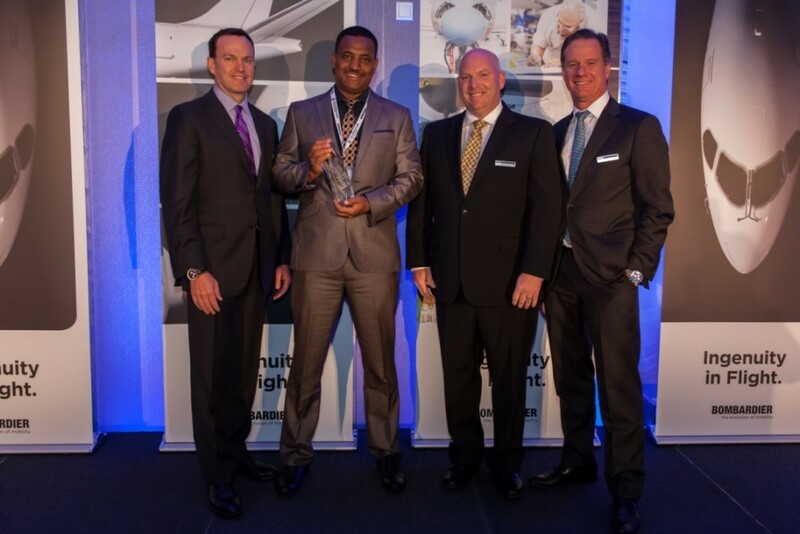 Ethiopian won the award in the Q400- Africa and Middle East Region for High Dispatch Reliability of a Q400 Fleet, placing it first-overall in the Q-400 product category for the region. The award recognizes the skill and dedication of Ethiopian’s employees working on the turbo-prop and light aircrafts of the airline. Ethiopian currently operates Seventeen Q-400 Next Generation aircraft five of which were re-configured into business and economy classes with 7 and 60 seats respectively. The Q-400 is an ideal aircraft for domestic and regional flights with a speed comparable to narrow body jet airplanes and with reduced noise, fuel consumption and emissions. Ethiopian flies the Q-400 to 20 domestic destinations and regional routes such as Djibouti, Mombasa, Kilimanjaro, Dar-es-Salaam, Zanzibar, Entebbe, Kigali, Juba, Khartoum and Hargeisa. Ethiopian commands the lion share of the pan-African passenger and cargo network operating the youngest and most modern fleet to more than 85 international destinations across five continents. This entry was posted in Airlines, Airports, Flights, Transportation, Travel, Travel Management, Travel Services, Travelers and tagged 2015 Airline Reliability Performance Award, Bombardier Aerospace, Ethiopian Airlines, Kidus Melkamu. Bookmark the permalink.